Good Night, Chicago, Good Night! This year, we decided to do our challenge on location, specifically the location of Noon & Wilder ourselves. Originally, I’d planned to do one day Chicago, one day Las Vegas; however, in brainstorming my list of A to Z, I realized I had plenty from which to choose for the Windy City. And anyway, our series The Chicagoland Shifters is set right here, so it seemed appropriate. One of the things I love about the challenge is the opportunity to meet other bloggers. It turns out that one of my fellow challengers decided to do Chicago too, and we struck up a great conversation over the days of the challenge together: Laura Roberts, at the Buttontapper Blog. While she’s in San Diego, she misses her time in the Windy City; and I’m a former Californian. This just proves what I’ve always suspected: the world really is a lot smaller than we think it is. If I had to pick the theme for next year now, it will be Las Vegas, but a lot can happen in eleven months. So keep your eyes peeled, Dear Reader, and visit us often for news, new books, and lots of fun. Thanks for reading! And here, for your browsing pleasure, are the posts in order. C: Dude. Of Course – Chicago Pizza! E: Get Your Pink On – In Edgewater! S: Willis! Sears! Willis! Sears! Willis! Sears! Whatcha Gonna Callit? W: Wrigley Field – Play Ball! The theme at Noony’s blog, Explore the Worlds of A. Catherine Noon, is The A To Z of the Zoo. Join her as she explores Brookfield Zoo and finds animals, birds, and insects from A to Z.
Noony’s theme on Knoontime Knitting – One Writer’s Journey Into 3-D craft blog is Letterforms In Nature and the Built Environment. The Nice Girls Writing Naughty have a new home, and we’re blogging in the challenge again this year. Throughout the month you’ll be hearing from each of the Nice Girls, and during the RT Booklovers Convention from April 12th to the 17th, you’ll be getting live convention reports. Join the conversation! The Writer Zen Garden’s brand new website is up and running, and we’re bringing you posts from Noon & Wilder; the talented Darla M. Sands – a blogger in her own right, see below; as well as Grace Kahlo, Evey Brown, and author Tina Holland. Check it out! Write on, and Happy Blogging! Well, Dear Reader, we’ve made it. A day late, maybe, but no dollars short on this tour of the Chicagoland. That’s a funny term: “Chicagoland.” I remember when I first moved here, I heard it used on the radio by a dj and thought is sounded ridiculous. “The Chicagoland.” Dude, it’s a city; it’s got a name. It’s not a land. But, regional dialects prevail and I now use the Chicagoland like a native. It refers to the “metro area,” which varies depending on who you talk to, but basically means all of Cook County, (where Chicago is located), as well as the “collar counties,” usually encompassing, but not limited to, DuPage, Kane, Lake, McHenry, and Will. On a side note, another regionalization I didn’t like but ended up adopting is the Southern California habit of referring to a numbered highway as “The such-and-such.” As in, “I’ll take the four-oh-five to the five over to the ninety-three.” That’s not something someone from Northern California would say. In fact, I noticed when I went north on school breaks or after I graduated and moved back to the Bay Area, I automatically dropped the “the” when referring to highways. Sadly, here in Illinois they refer to it the way they do in Southern California so I’m afraid I’ve adopted the habit pretty much full time: “Take the Ninety-Four to the Dan Ryan and over the Skyway.” That’s something else odd here: they name the highways, which isn’t in and of itself odd, but they don’t use the names on a map so when listening to the traffic report, it’s next to impossible to decipher what the heck they’re saying unless you know which name goes with which highway. “We’re seeing a gaper’s delay on Ronald Reagan due to an earlier collision but it frees up by the time you get to the Tri-State. And in other news, the Dan Ryan construction project is done and clear sailing until you get to the Spaghetti Bowl, and on up until the Edens split. Then it’s fine up to Lake Cook, but the Kennedy is backed up all the way to the O’Hare Oasis.” Huh? But I’m not here to talk about language, Dear Reader; I’m here to talk about zoos! Chicago has a wealth of them, because there are TWO! I’ve been reviewing Brookfield at my main blog this month in “The A to Z of the Zoo,” but I also wanted to mention the sister zoo, Lincoln Park. Admission, (though not parking), is free, and it’s smack in the middle of Lincoln Park. That’s an easy cab ride, bus jaunt, or adventurous walk from downtown. In addition to zoo stuff, they also have the Farm at the Zoo, which lets urbanfolk see what a real working farm looks like. Across the street is the Lincoln Park Conservatory, as well as the Peggy Notebaert Nature Museum. Also, for you locals, we have one of the largest regional organic farmers’ markets that operates year-round, the Green City Market. If you’re at all interested in food politics, check them out; in addition to a bustling market they have an active political activist arm as well. So I’m sad to say that the A to Z Challenge is over for 2016, but be sure to check back on May 9th for the A to Z Reflections Post Day, and the Linky List is open from May 9 to May 13. Keep an eye on the main A to Z Blog Challenge page for more info and updates, and of course come back here on the 9th for my reflections on my various posts. Also, if you’ve visited me and I haven’t responded or visited back, please forgive me; I’ve had a nasty cold and do plan to catch up to everyone over the coming days, I promise! Chicago. That toddlin’ town, known for its pizza, and hot dogs, and the Cubbies, and… YARN! Really, this is a great place to have a yarn problem. Addiction, even. There are all sorts of places one can get into trouble with sticks and string. One of the largest guilds in the country is here, the Windy City Knitting Guild. The men and women of the guilt span the demographic spectrum and are friendly and inclusive. They have monthly meetings and weekend workshops, as well as a ton of resources on their website – including a list of local yarn groups and shops. Formerly Loopy Yarns, Yarnify bills itself as a Community of Fiber Artists. From small beginnings, great things grow. Knit 1 Chicago was started by a former WCKG guild member and has become a mainstay of the north side. Richmond, Illinois, is home to one of my favorite yarn shops in the country, Wool, Warp and Wheel. The annual Sheep and Wool Festival is just over the border in Wisconsin and is well worth the trek. You can shop for fiber to your heart’s content (no, really; it’s a huge marketplace), and they have working sheep dog trials, sheep sheering demonstrations (these are well worth seeing, trust me), and all sorts of information for those who want to get in on the husbandry side of the fiber trade. The annual Fine Art of Fiber event at the Chicago Botanic Garden is a must-see for anyone interested in the fiber arts. If you’re an artist, this is an excellent regional event. Highly recommended – and not just for knitters. Weavers and other fiber artists are represented as well. Galena, Illinois, has another of my favorite yarn shops, FiberWild. On the main drag not far from the DeSoto House, it’s a fun place to stop in and, if you have some time, sit down and put on a few stitches. The Yarn Pot in Elmhurst is small right now, but growing. The proprietor is a teacher and avid fiber artist. Well worth a visit, and it’s just upstairs from a great local coffee cafe. Do you have other local treasures you enjoy? Share with me in the comments; I’m always on the look-out for LYS’s (Local Yarn Shops). Remember – by supporting these local businesses, we keep the community alive. Wrigley Field – Play Ball! Image used under Creative Commons license from Wikimedia Commons. My post is tardy, Dear Reader, and for that I apologize. The cold that’s going around is enjoying itself by jumping up and down on me. I’ll catch up, I promise! Here then, is the post for yesterday, or “W” – Wrigley Field! In my household, we have divided loyalties. My husband and I are from other places, originally – me, the West Coast; him, Philadelphia. As transplants to the north side, we both are Cubs fans. His son, however, is a Sox fan. And we haven’t once smothered him in his bed. That’s how Cubs fans are. Nice, ‘n stuff. GO CUBBIES! 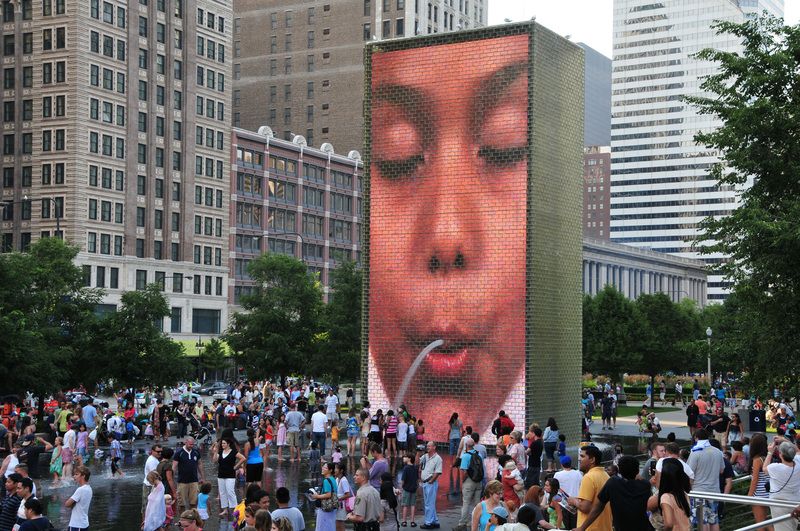 One of the odder pieces of public art in Chicago are the Crown Fountain, located smack in the middle of downtown and an anchor point of Millennium Park. Two giant square columns, built of what looks like glass bricks, face one another across a stone courtyard. Different faces appear on the sides that face each other, and a stream of water flows out of the mouths and fill the center courtyard so people can dance around in the water. I’m not actually sure what to think about them. They’ve been there for a few years now, and are, I suppose, a fixture of the city. They’re certainly eye-catching. They’re right along Michigan Avenue, north of the Art Institute and catty-corner to the Chicago Cultural Center (which is the building with the columns behind the fountain in the above picture). The city has many art installations thanks to our previous mayor, Richard M. Daley. The entirety of Millennium Park was built under his administration, and the new Maggie Daley Park was recently completed and opened to the public. I’m not sure what I feel about the face fountains, but I like the fact that they have pictures of all different kinds of people, from kids to senior citizens, and all different ethnic backgrounds. While it may not precisely be my cup of tea art-wise, it’s something to talk about in the city and it attracts tourists from all over – which you can also see from the above picture. One of the things I love about Chicago is the opportunity to study pretty much anything I want. Four of the top twenty-five universities are here: DePaul, Loyola, Northwestern, and the University of Chicago. Top-tier state schools, the University of Illinois – Chicago and Northeastern Illinois University are both here, as well as excellent private universities such as North Park University and Roosevelt. The list doesn’t stop there. If you have a yen for higher learning, this is your town. Not just that, though. There’s also the Pacific College of Oriental Medicine where you can learn eastern healing modalities such as acupunture and massage, the Chicago Weaving School where you can learn – you guessed it – weaving techniques from the simple to the complex, and Middle Eastern Dance at Arabesque. At the Old Town School of Folk Music you can learn, yes, folk music, but also traditional dance, choreography, and musicology. The Chicago Park District has classes in everything from sports to woodworking and lapidary, and the Spertus Institute for Jewish Learning will teach you all sorts of things about Judaica and non-profit management. If more esoteric disciplines call to you, learn astrology or tarot at the Discovery Center – along with investment techniques and fitness. It’s safe to say that Chicago is a curious city. Tomorrow, we’ll see what V holds in store for us. Sorry that today’s post is late; I have a cold and have spent most of the weekend sleeping. If you live in Chicago, or are here for an extended visit, you are more than likely going to encounter the elevated commuter trains – locals call it the “L,” for short. My husband and I, above, use it to get to the airport for vacation, for example. I used to use it every day when I worked downtown; now I simply take a bus since I live so close to my day job. There are many pictures of the “L” online, but the ones I like are the ordinary ones. This view, for example, is one of my favorites along the Brown Line, because it’s when the “L” goes over the conventional railroad tracks and you can see for miles in either direction. You whizz by too quickly to get a good look, but I always wonder what it would be like to get on those tracks and see where they go. This direction, southbound, would end up in New Orleans. The other way goes clear up into Canada. What about you, Dear Reader? Where do your trains go? Willis! Sears! Willis! Sears! Willis! Sears! Whatcha Gonna Callit? At one time the tallest building in the world, the Sears Willis Tower is the tallest building in a city of tall buildings. Finished in 1973, it’s actually separate buildings built together like a handful of drinking straws. They don’t tell you until you’re in the elevator to the top and the famous Skydeck that there aren’t cables holding the elevator up, but pneumatics: i.e., air. WTF? If it wasn’t 108 stories up, I’d’ve walked down. As it was, my hands sweated the entire way. For those of you who are way braver than me, there’s even The Ledge. That’s right, a lucite box, suspended over… nothing at all. Friggin’ A, man. You just stand there with your feet out over God’s creation and hope that whoever nailed that puppy to the side of the building used REALLY BIG NAILS. But seriously, this is a cool place to tour. And, as tours in Chicago go, it’s not as expensive as an Architectural Tour, if you’re on a budget. You can see clear across Illinois to Indiana, Michigan, and Wisconsin, though I’m not sure about Iowa. (That’s a couple hundred miles away, after all.) The Skydeck has a wraparound series on the walls depicting the history of Chicago, and of course, there are the windows. You should check out the website link I gave you in the first paragraph, because there are even video tours online that can whet your appetite. Just don’t ask me to come out on the Ledge with you. For that, Dear Reader, y’all’re on yer own. It amuses me no end that they use lettuce for ornamentals, too, but that’s a different issue. There’s a park not far from my house which runs from here, at the southwest border of Rogers Park, all the way down to, I believe, Albany Park. Regardless of what they call it, walkers and cyclists can wander, even using pedestrian tunnels, without risk of getting clipped by a passing car. The trail is a couple miles long and is part of the wildlife corridor the city’s built for area wildlife to get clear up into Wisconsin. And it’s lovely in all kinds of weather. The heavy underbrush in the left of the photo is a native species restoration area; posted signs warn visitors to keep out because they’re letting the flora re-establish itself. We’ve seen green heron, red fox, deer, raccoons, and all manner of birds using this place. For those of you curious about specifics, there’s a Rogers Park/West Ridge Historical Society and museum, and you can visit their website, here. Loyola University has a campus here over by the lake, and Lunt Street Beach is my favorite along the lakefront. My neighborhood has seventeen different languages just on my block, (we counted), and there are people here of all different ethnicities, religions, orientations, and backgrounds. You can walk down a street and see an Ethiopian restaurant, a Zabiha meat store, and a Jewish religious artifacts store. You can find Russian books, music, and memorabilia, there’s a Georgian (as in the country Georgia, not the state) bakery, and an organic foods restaurant with its own garden on the roof. Pretty awesome place, Rogers Park. (1) “Explore Chicago’s Neighborhoods: Rogers Park,” The Chicago Tribune, 11/14/2008, web page accessed 04/20/2016 from the following link. See how I did that? There’s a “Q” in aQuarium, right? So it’s a Q word. But really, I have an ulterior motive: one of my favorite parts about Chicago is its museums. And the Shedd Aquarium is one of three on the “Museum Campus,” the other two being the Field Museum and the Adler Planetarium and Astronomy Museum. You can even craft a special memory with Extraordinary Experiences, behind-the-scenes adventures. One of the earliest aquariums in the U.S., it is home to many species of aquatic life. They have a large section devoted to Pacific marine life, but I’m spoiled by having grown up on the west coast. What I love is the enormous aquarium tank right in the front of the place as you walk in, filled with all sorts of fish. I think I like aquariums because they’re generally fairly quiet and softly-lit. Fluorescent lighting gives me a headache, and typically places like this don’t have a lot of it and what there is, is pretty muted. One interesting tidbit is that when you visit the aquarium, they give you a handout on what fishes are safe to eat because of mercury contamination.